Security of your data is must be at top on your list, but as nowadays we owned multiple device like PC, laptop, tablet and smartphone, so we need to assure that we are protected at all levels across all devices and for this Norton 360 Multi-Device is a best example. This security suite comes with a single key to protect all your devices, it can protect your Windows PCs, Mac OS X, Android Devices and of course iOS too. If you are on a Blackberry or Windows Phone then you are out of luck. Installation of Norton 360 Multi-Device is straight forward and simple, you could either start installation process from the web or you can install it from the supplied CD as well, there won’t be much menus and selection while installing and it won’t ask for restart either when it finishes installing. When installation is finished, you will get a message which says You Are Protected, and then you will be treated with a simple main home screen where you will find four options with few tabs at the top. After that you need to make an account with Norton or if you have an existing account then sign-in, once you logged-in you just need to sign-in from another device to install it, yes just sign-in and no need to enter any key. 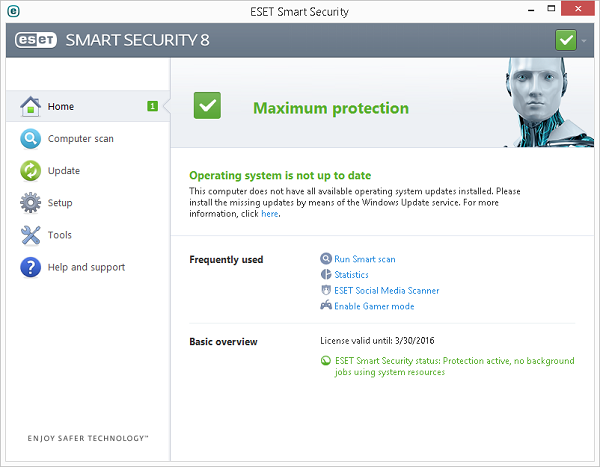 Under the Security tab you will find options to Quick scan or scan your computer or update your Norton virus database. There is a Firewall option too under Security option which lets you check set the access of program and traffic rules for network. There is a useful tool, Norton Insight which lets you find out what the resources running in the background and which executable file is sucking memory most. Under Identity option you have Norton Identity Safe which protects you from harmful websites, it has Safe Web, Antiphishing. It has internet meter which shows the website which you are going to visit and also warns and protect you from Phishing Attacks. It can also scan your emails on your email clients like MS Outlook along with integrated contact list. Norton 360 came with 2GB of of online storage where you can backup your data but Norton 360 Multi-Device or Premier comes with 25 GB of online storage to backup your important data on the cloud so that you never lose your important files. You can always buy more storage anytime. 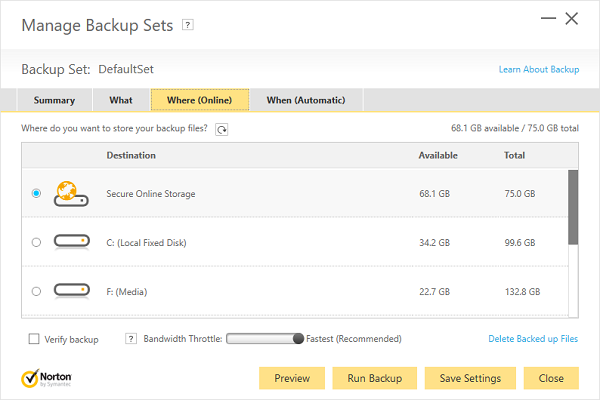 You can schedule backup so that it can automatically take backup. Norton 360 Multi Device comes with PC Tune-UP utility which can clean junk and trash files from your computer, it has the option of Disk Optimization, Delete Temporary Files (Windows And Internet Explorer), Delete Internet History, Registry Cleanup and Start-up manager. These provide basic functions and you can get some freeware which provides more functions than this. It comes with a password management tool, Norton Identify Safe which can import your password list from Internet Explorer and Mozilla Firefox, we did try it with Chrome but it failed, the main vault is protected by a master password and it can auto-fill your credentials too. You can also save your credit card details and it will be synced with your account and will be available on other devices when you login. It also comes with Norton Insight which gives detail report about how much CPU is being used by Norton, it shows a nice graph, it clearly shows Norton is using very less CPU and its not much higher on your system. It also gives your resource usage as per months also. You can download Norton Mobile security from your app store, its free but when you upgrade you will get more features like, SIM Lock, Scream, Data Wipe, Locate your device, Call and SMS blocking and much more. You can download and install the free version and just login with your account to upgrade. It can block any of your incoming call or SMS, you can just add any number to it so that future calls can be blocked. When any number is blocked, the caller will get busy tone and you will see a miss call, however SMS blocking worked fine with the default messaging app, but if you are using any third party app then it didn’t work well at all. Backup feature on it can backup your contacts, you can schedule back so that it can automatically backup it. 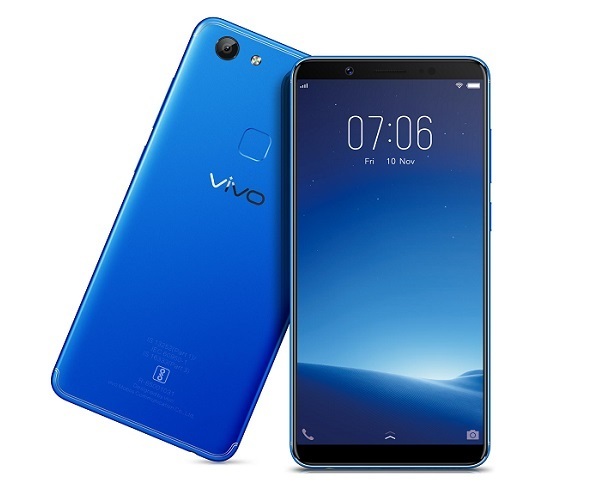 It can scan your device all your call or on schedule, you can even scan your SD card and it also scan all apps which you had installed or installing. But one thing which we didn’t like is that the app is not protected in anyway, anyone can uninstall that app from your device, it should be password protected, even anyone can open that app and make changes, earlier I had used KasperSky which can be uninstalled only with a password. You can track, wipe data and send SMS commands via the web also, web UI is easy to use and simple, when you login to web version you will find all options in front of you. You can locate your device location from there, lock your device, you can make your device scream in which your device will ring and no matter even your phone is on silent mode, it will ring if you make it scream. You can also find your phone’s location via web, in our test location finder work very well and it shows locations very well.From web UI you can also sneak peak into your device in which Norton will capture images from your front camera and shows who is using it. All this command can be made via SMS also, just send SMS Command along with your your passcode to activate the command. Norton 360 Multi Device offers complete solutions to your all device, installation and activation is very simple. Back solution is good and offer 25GB which is more than enough for most of us. Location finder works fine and trace your device very much accurately. And the most important thing is that it doesn’t hit hard on your device, whether its your PC or phone, it uses very low resource. The thing which we didn’t like is that it doesn’t offer any security of apps on Smartphone, if your phone gets stolen then anyone can easily uninstall it from your device and then you won’t be able to use any remote command.